With many hands in the kitchen, we got right to work. Placing all the mince in big pots and browning the mince. Deidre and Euan were cutting onion after onion and battled through the tears to get the job done. They both then helped chop carrot and zucchini. Debbie was busily running around helping everybody with their jobs and working out the next steps of the recipe, all the while looking after simmering pots of mince. We added the vegetables to the mince and then allowed it to simmer for several minutes before adding the ricotta cheese. We stirred the cheese through and then proceeded to scoop the mixture onto a tray lined with pastry sheets. We cooked these for 45 minutes until golden on top. 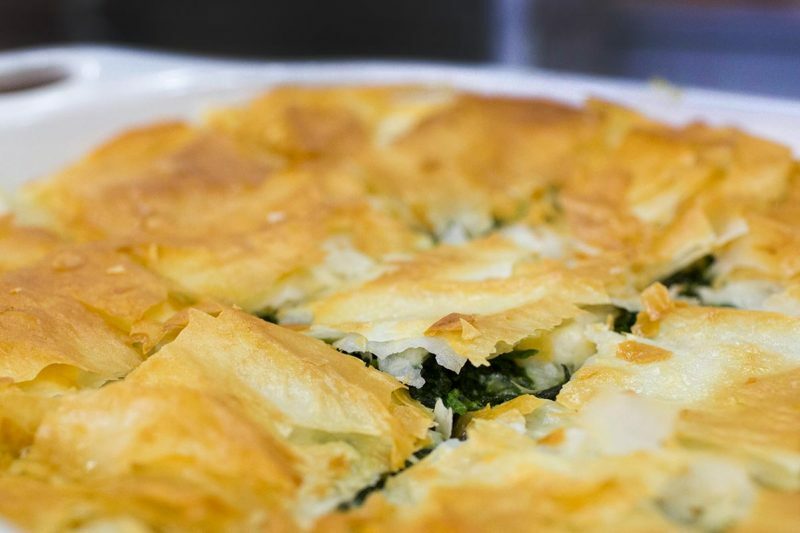 We then cut the Spanakopita into sections and served this in containers. We had also prepared garlic bread and served hot cross buns, both of which were kindly donated by Baker’s Delight Toombul. This was a genuine team effort, and some special thanks need to be said to the following people. Debbie who did exceptionally well for cooking a record 91 meals, organising the kitchen and making one of the best meals I’ve ever seen cooked in the Dig In Kitchen. A special thanks to Deidre for doing a fantastic job in the Kitchen and for her enthusiastic attitude. We are looking forward to her meal in the coming weeks. Also a huge thanks to Euan who was an extraordinary volunteer and for someone with limited experience in the kitchen and should be proud of his efforts especially considering his young age. This was the first-time Deb had cooked in such a large quantity, and it was a huge hit. All the meals were quickly devoured, and everyone loved them so much that the next week we still heard about how good it was. Even I was hungry just looking at the meals. At Dig In, anyone can volunteer regardless of cooking experience. There are many areas which people can get involved. While cooking large amounts of meals can be intimidating it is a team effort, and everyone in the Kitchen is there to help. As the saying goes many hands make light work and this is seen in the Dig In kitchen.